So, in the meantime, please enjoy this ultra-feminine pink & green tablescape I created a couple of years ago for a ladies’ luncheon just about the time I first started blogging. It has been hidden on the “Summer” page of this blog, so this may be the first time you’re seeing it. This table would be a great one for celebrating Mother’s Day, a birthday, a wedding shower, or even in honor of a breast cancer survivor. I have a great fondness for ladies’ luncheons. I am so much more at ease and relish the time spent with friends lingering over girly salads and quiche! When it’s just us girls, I can go all out pink, floral, delicate…no worries! This luncheon tablescape in our back yard has all the elements of femininity at its all out best: lots of pink and lots of floral! The napkins from Bed Bath &Beyond are simple poly-cotton in a deep shade of ivory with a BB&B woven green napkin ring. Tucked inside to mimic the colors and shapes in the table covering is a bit of deep green sword fern and a budding pink cymbidium orchid. I wanted to do something a little different to accentuate the feminine side and the outdoorsy feeling of the tablescape. Tucked beneath a miniature cloche bell jar (Hobby Lobby) is a mound of bright green reindeer moss topped with an orchid. This feature is simply removed from the luncheon plate after the ladies are seated. The grand 16″ cloche bell jar in the center of the table lords over its more diminutive counterparts and remains on the table throughout lunch. To slightly differentiate it and further play on the outdoor theme of the tablescape, a gazing ball is added along with reindeer moss, sword fern and cymbidium orchids. Orchids and a tiny cluster of reindeer moss are affixed to the bell jar with a bit of Cling floral adhesive. Cling is great, but beware: clean up can sometimes be a bit of a challenge! To sidestep problems, always roll it into a ball. Any residue can be easily removed with Goo Gone or similar adhesive removal products. Another little tidbit: orchids are resillient and will hold up without a water source for several hours unless it’s scorching hot! 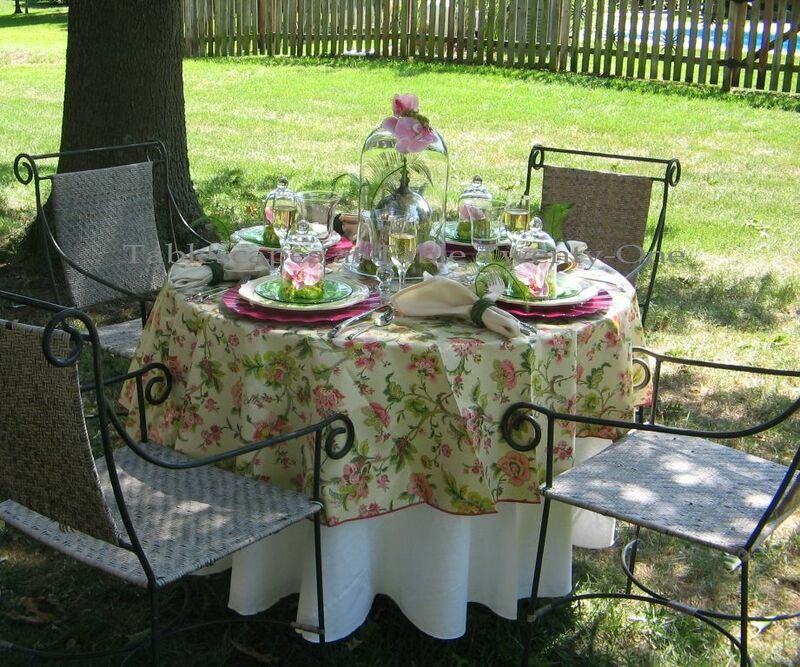 I am linking up with Susan’s Tablescape Thursday again this week. You might want to check it out to see what all the other tablescape enthusiasts from around the world are up to! Check in anytime after 9:00 CDT on Thursday morning. This is so so soooooooooooooo lovely. Guess what??? I just happened to browse through my Spam folder as I often do before emptying and there was this Tablescape message. What a disaster to have lost this beautify piece of work. I have no idea of how it got there. So beautiful! I just love the cloches. I need to get some! Only you could make vinyl look amazing! Oh my again Alycia…the table is fit for a queen…or the Queen Mother…I just love the way you placed the orchids under the cloches……I truly love the colors you chose…perfect for the ladies…The outdoor setting under the beautiful shade of the trees is so refreshing…so where’s the hammock..??…. I’ll be there at noon with a couple of bottles of Sauvignon Blanc! This is absolutely gorgeous — I just don’t know what else to say. Amazing, Alycia! The orchids and cloches, wow!! Gorgeous gorgeous gorgeous!!! Beautiful table, Alycia. I would never have guessed that was a vinyl tablecloth! It is lovely. I did pink, white and green this week, too! It’s beautiful Alycia…one of those perfect dream like settings in a garden! Hmm…..I might have to steal a picture for my garden blog! The orchids with the moss under the cloche’s really give this table a special touch! I love how you dressed the top of the large cloche with them too! Bringing the inside out and the outside in! Love the sword fern accents too! Now on to the dishes! Alycia, I always love your tablescapes, but honestly, this is one of my favorites. The colors are so lush and how fabulous are the orchids under the cloches. The tablecloth is so pretty and who would have ever guessed it’s vinyl? This is lovely, Alycia. Perfect for a garden setting. 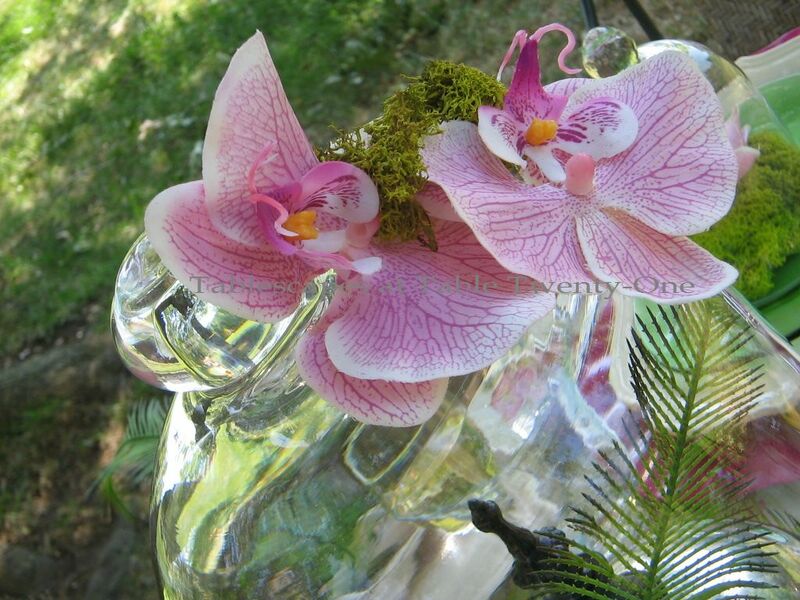 I love the gorgeous orchids and pretty way of you putting them in the cloche especially the centerpiece. Happy Mother’s Day! Alycia, this has to be one of my favorite tables you’ve done! Your love of ladies luncheon tables shines through! The colors are so soft and pretty, and even though there are some outdoorsy elements, it just exudes elegance. The plate layering, finishing off with the mini cloches, is sweet, feminine, and whimsical. I jut love it! So, so pretty and feminine, Alycia! The orchids really put it over the top! I didn’t know they could go without water for a while. The hot pink chargers are wonderful! My daughter has those in lime green. I can just see you and your friends enjoying a leisurely lunch together in this lovely setting! I would NOT have guessed that was a vinyl tablecloth!!! I love that you kept the dishes quiet to allow the bold print to speak up. As always you have created a lovely tablescape. Makes me want to go play with my dishes outside. Let’s have lunch soon, OK? You need to stay in town more often! This is so lovely. love the cloches. I would have never know the tablecloth is vinyl….sweet! The orchids are beautiful and add so much color and beauty to your table. I can’t imagine your head having any issues trying to come up with ideas here. The hot pink chargers are gorgeous and I also love the green plates. What’s not to love? you never disappoint and it’s always fun to drop in to see what you are up to. Again, Happy Mother’s day. I did my Mother’s Day table in pink and green again…. I loved looking at all your beautiful Mother’s Day tablescapes, but this is my favorite. LOVE the orchids, ferns, cloches, and the gorgeous pink and green colors.